Puff, the Magic Dragon Pop-Up Giveaway! ‘Tis the season for giveaways. 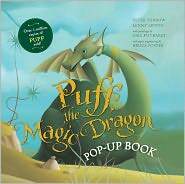 And today we’re giving away a copy of Puff, the Magic Dragon Pop-Up which we shared with you earlier this week. The book is an expanded edition of the much beloved book, Puff, the Magic Dragon, inspired by the song written by Peter Yarrow and Lenny Lipton (and of course, made famous by Peter, Paul and Mary!). We’ll pick one random winner from our commenters. To enter, just tell us your favorite lyric or share your favorite memory from the classic song (which is featured on an accompanying CD to the beautiful pop-up!) in the comments below. And if you can’t wait, don’t forget that you can also download the app for both Apple devices and Android! The contest runs through Thursday, Dec. 8th! 24 Responses to Puff, the Magic Dragon Pop-Up Giveaway! I was lucky to grow up with ‘family folk night’ once a week. Dad on guitar, mom singing harmony, and us kids finding our ins and outs of Dylan, Guthrie and, of course, Peter Paul and Mary. This song was always a favorite and now it’s one my kids ask for. What a great memory, what a cool book! How fun! I remember singing Puff the Magic Dragon when I was little! I was so intrigued with the fantasy of it, I’ve always loved fantasy! Listening to the song in its entirety (as most people just sing the first verse and refrain) has always been sad…maybe I’m just weird. A dragon lives forever, but not so little boys. I always found the song so sad. I knew I would stay with the fantasy world over the real world any day. Still would. They’re out of stock at Amazon now. My parents were huge fans of Peter, Paul and Mary. Growing up my favorite song from them had to be Puff the Magic Dragon. To this day I am a huge dragon fan. this book makes it even better being a pop-up. I’d love to have this for my first son who is coming this Jan. I think this song (and the cartoon special I vaguely remember from when I was a kid) may be what instilled my lifelong love of dragons. Just knowing that such big fierce creatures might be capable of befriending and protecting children was always a wondrous and comforting thought. whenever we were on a long car trip, my sisters and i would sing this song at the top of our lungs 😀 My grandfather made a music box that plays the song for my son when he was 2. Now, at 7, it is his favorite possession. Growing up, my parents were huge fans of Peter, Paul and Mary. They would play their records (yes, records!) on their stereo and my siblings and I would sign along. Sometimes, my uncle would come over and play his guitar for us. One of the first songs I can remember him playing was Puff the Magic Dragon. He taught us all of the words and we’d sing along with him. Later on, when I got older, he taught me to play the guitar and again, the first song I learned was Puff the Magic Dragon. Now that I have kids of my own (ages 5 and 7), I’ve introduced them to Puff through music and the movie. I know they would love to be able to read the book, as well. In fact, my 5 year old is very into pop-up books right now and has been asking for some for Christmas. It would be perfect if I could put this book under the tree! I remember singing this song as a kid. I loved dragons then and still do! When I was a child I would get to stay up late and watch Peter, Paul, & Mary on PBS when they would have their specials. My favorite song was Puff the Magic Dragon. I sing it absent-mindedly now and my 7yo son has no idea what I’m talking about. It would be nice to share it with him too. Its a catchy little diddy! I used to sing the Finnish translation/remake of the song when I was a kid. And I always hoped to have a dragon of my own. My mom loved this song, and would sing it to us in the car! My sisters used to sing that to me all the time when I was really young. Its one of my first memories actually! My favorite puff the magic dragon memory is getting to see the Hanalei bay. I’ve always loved the name “Little Jackie Paper”. It’s so instantly evocative. Count me in with the long-time dragon fans. One of my friends was ill with leukemia in middle school. Puff was her favorite song. At her funeral, her family had someone sing it, but he got so emotional that he couldn’t finish. I can’t hear the song even now without tearing up. Little Jackie paper – the name fascinated me as a child!